The 2nd quarter after implementation of value added tax (VAT) is underway and the authorities and experts are closely examining impacts of this newly-implemented tax on various sectors. Previously, this tax was also reviewed on few important sectors that were facing negative effects after VAT. One such example is the reversal of VAT on gold and diamond trading. A very important sector for UAE’s economy is hospitality and travel sector that pours billions of dollars in the country’s economy every year as a result of arrival of millions of tourists from different parts of the world. But the latest quarterly report regarding this sector is quite satisfying. This report shows a sustainable growth in number of visitors and hotel occupancy during first quarter after implementation of VAT. According to details, experts were pleased on performance of hospitality & travel sector as it showed steadiness and positive attitude in first quarter of year after the implementation of VAT. The report shows that number of visitors rose by 2% (4.7 million in total) and the occupancy rate of hotels increased up to 0.7% during the same period. It is a clear indication that the impact of VAT on this sector is minimal and businesses are gaining consistent profit despite this new tax. An important reason that VAT has minimal effect on travel & hospitality is due to the fact that this tax is not implemented on wider scale and few parts of this sector are exempted from VAT. An example is zero taxation on airlines that helps to retain previous air fares. This encourages the visitors to enter UAE without paying anything additional. But there is 5% VAT on hotels in UAE while the tax has also been increased on several leisure activities. But tourists managed to reduce their cost by choosing a slightly cheaper hotel and activities. On the other hand, hotels and restaurants are also happy to bear some burden of the tax in order to attract more and more tourists that arrive in the country in large number every year. It clearly means that this selected tax on hospitality and travel industry has benefitted everyone without applying unnecessary burden on any part of the sector. Another important reason for growth of this sector is the rate of tax which is just 5%. 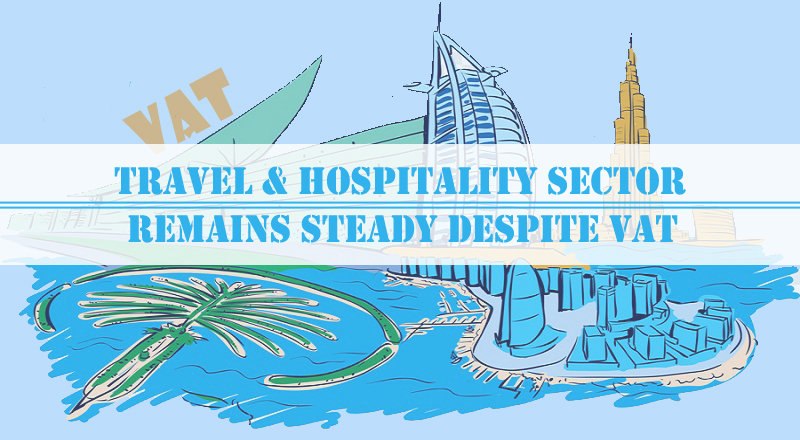 The recent statistics clearly reveal that the travel & hospitality sector can easily expect further growth in coming months and years as people from different parts of world are expected to arrive in UAE in large numbers like previously. This clearly highlights the prospects of growth of businesses related to travel & hospitality sector in future.